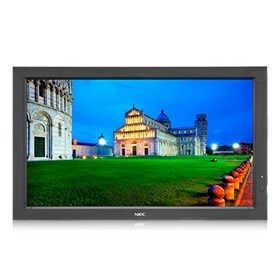 The NEC V323-AVT is a 32” high-performance large-screen display utilizing LED backlighting to deliver both environmental and functional benefits for digital signage. AV inputs and a built-in ATSC digital tuner (SB-03TM) are included in this display. Its commercial-grade panel is capable of displaying brilliant imagery and capturing the audience’s attention. This full HD model features built-in 8W speakers and an Open Pluggable Specification (OPS)-compliant expansion slot, which future-proofs the display and allows for the seamless integration of a computer or other NEC/third-party component. Additional cabling is not required because video, RS-232 control and power are passed internally from the display to the computer, thereby simplifying installations. With integrated temperature sensors and fans, this display is ideal in applications that require extended use, including retail stores, restaurants, indoor venues, training facilities and corporate boardrooms. The NEC V323-AVT has many exciting features for users of all types. See the NEC V323-AVT gallery images above for more product views. The NEC V323-AVT is sold as a Brand New Unopened Item.